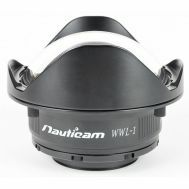 The 0.36x Wide Angle Conversion Port (WACP) is the most exciting product for underwater photographers in a long time. Water contact optics have not been available to most shooters since the Nikonos and Nikonos-RS film systems. 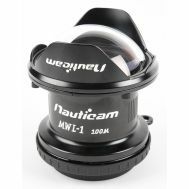 Some of those lenses like the Nikonos 15mm f/2.8 and Nikonos-RS fisheye 13mm f/2.8 are still popular today and Nauticam makes adapters so you can use them with compatible Sony and RED systems. Unfortunately, these lenses only work with a small percentage of current cameras and there is a limited supply available on the used market. The Wide Angle Conversion Port gives Full Fame, APS-C and Super-35 image makers the opportunity to use true water contact optics. So what is a water contact optic and why would you use one? All domes suffer from corner softness. It is important that you use the correct size dome and extension ring to minimize the problem, but the softness will always be there to some degree. It is most noticeable when using wide apertures. A common technique has been to stop down to around f/13 on FF and f/8 on APS-C to reduce the softness. It is not always practical to shoot at these small apertures especially in darker environments. Water contact optics correct for this corner softness allowing you to shoot at wider f/stops. In addition the 0.36x Wide Angle Conversion Port increases the angle of view of any lens used behind it up to a maximum of 130°. This is a field of view that sits between the popular full frame fisheye lenses (180 degrees diagonal) and ultra wide rectilinear zooms (approximately 110 degrees). So how does it work? The WACP is much more than a port. It is really a lens or more correctly the front half of a very elaborate lens. The lenses that we use with the 0.36x Wide Angle Conversion Port act as the internal components of the lens, performing auto focus and electronic aperture. The WACP is designed with precisely ground elements of highly refractive optical glass. The cutting edge optical design results in extremely high overall sharpness and contrast. The design is optimized for the high resolution sensors of today, as well as the even higher resolutions sensors of tomorrow. 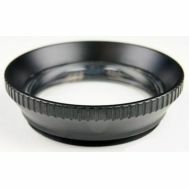 When placing a lens behind the WACP there is a 0.36x conversion, so a 28mm 75° lens effectively becomes a 10mm 130° lens. It is not limited to prime lenses or a single fixed focal length, the 0.36x Wide Angle Conversion Port is designed with full zoom through capability. A lens like the Canon EF 28-80mm f/3.5-5.6 V USM gives you almost a 3x zoom range. Every lens that has been tested so far is able to focus on the front dome lens element, maximizing the impact of even small subjects. This opens up new close focus possibilities and video shooters will be able to get wide, medium and tight coverage all on the same dive! A float collar and other accessories will be available soon. A current compatibility chart is available here.